Notes: Extremely rare cover postmarked in both Hollywood England and Hollywood USA. 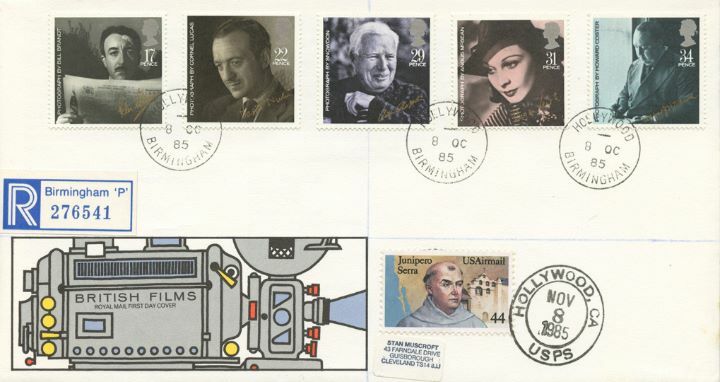 The above Royal Mail British Film Year stamps were issued on 08 October 1985 by Royal Mail and feature the following stamp designs: 17p Peter Sellers; 22p David Niven; 29p Charles Chaplin; 31p Vivien Leigh; 34p Alfred Hitchcock. The Double Dated Hollywood cover first day cover with the Hollywood CDS Postmark postmark has been produced by Royal Mail/Post Office and features these stamps which can make a very collectible and lovely gift.